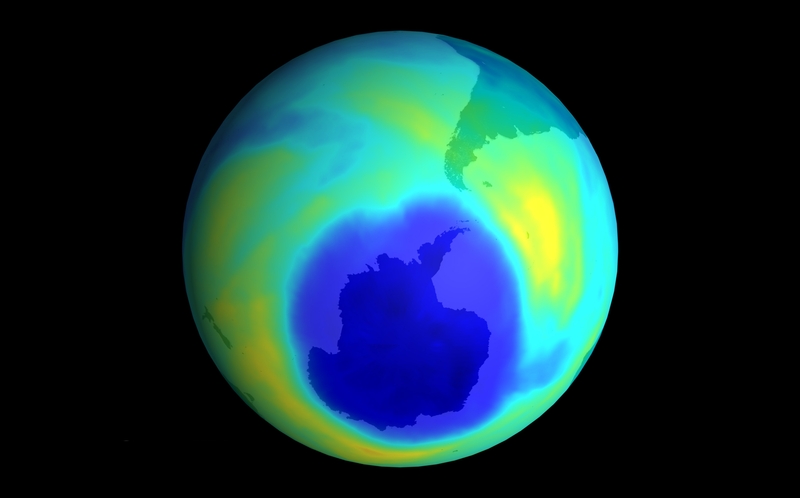 This NASA image shows the ozone hole over Antarctic in 2001. The earth’s protective ozone layer is not recovering uniformly from the damage caused to it by industry and other human activities. And scientists are not sure why it isn’t. An international research team says the ozone layer, which protects humans and other species from harmful ultraviolet radiation, is continuing to recover at the poles. But recovery at lower latitudes, where far more people live, is not. There is a link between ozone depletion and global warming, though they are different and neither is the main cause of the other. Some suggested CFC replacements themselves proved to be powerful greenhouse gases. CFCs and the other ozone-depleting gases were banned under an international agreement, the Montreal Protocol, and since then parts of the layer have been recovering, particularly at the poles. Ozone forms in the stratosphere, between about 10 and 50 kilometers above the Earth and above the troposphere where terrestrial species live. Much of it is in the lower part of the stratosphere, where it absorbs UV radiation from the sun, which can damage DNA in plants, animals and humans if it reaches the earth’s surface. So the discovery in the 1970s that CFCs were destroying the ozone layer and causing the Antarctic ozone “hole” sparked rare international co-operation to solve the problem. The outcome was the 1987 Montreal Protocol, the phase-out of CFCs, and, recently, the first signs of recovery in the Antarctic. The upper stratosphere at lower latitudes is also showing clear signs of recovery. “…This new research is interesting and provides a novel perspective on changes in the ozone layer. It shows that even in an area of science that is fairly well understood there are still surprises in the fine detail. “It is clear from Antarctic data that the ozone layer is beginning to recover where it was worst affected, though it will take many more decades before it is back to its condition of the 1970s. Joanna Haigh, co-director of the Grantham Institute for Climate Change and the Environment at Imperial College London, is co-author of the study. She said ozone had been declining seriously since the 1980s, but while the banning of CFCs was leading to a recovery at the poles, this did not appear to be true for the lower latitudes. Although they’re not certain what’s causing this decline, the authors suggest two possibilities. One is that climate change, fueled by global warming, is altering the pattern of atmospheric circulation, causing more ozone to be carried away from the tropics. The other is that very short-lived substances (VSLSs), which contain chlorine and bromine, could be destroying ozone in the lower stratosphere. VSLSs include chemicals used as solvents, paint strippers, and as degreasing agents. One is even used in the production of an ozone-friendly replacement for CFCs. The study was the work of researchers from Switzerland, the U.K., the U.S., Sweden, Canada and Finland, and included data from satellite missions, including by NASA.